Today is Nie Nie Day! A day where the blogging world is trying to raise as much money for the Stephanie and Christian Nielson Rehab Fund. I’m feeling the love, energy and desire of everyone who is helping this family out. It’s absolutely beautiful! And I’m so excited to participate. My silent auction will be on a necklace that I designed specifically for Stephanie, and her personality I have come to know through blogging. It’s a simple, charming bird festoon necklace available in either 24K gold vermeil finish or sterling silver (winner’s choice). The length of the necklace is 18″. All the proceeds and payment goes directly to the Stephanie and Christian Paypal Fund. Shipping will be on Darleen Meier Jewelry. -Anonymous commenting is welcomed, but please leave an email address for contacting or name or something! -Once the bidding ends, the winner will be announced and I will either contact you or you can email your shipping information and the preferred necklace metal finish to darleen@darleenmeier.com . -At this point, the highest bidder will directly donate the decided amount to Stephanie and Christian’s Paypal account and then forward me the paypal confirmation. I will then ship out the necklace. Simple as that and you will be helping out a family who is in much need while getting a little something in return. Click here to see a list of other auctioneers. Information about Nie Nie: Stephanie Nielson and her husband Christian were in a terrible plane crash that took the life of one person. Stephanie and Christian are in critical conditions with third-degree burns. Stephanie has burns that cover 80% of her body. Both of their recoveries are going to be lengthy and will cost a tremendous amount of money. They are parents to four small children. Since Stephanie is known in the blogging world, bloggers all around have an urge to take action and help. 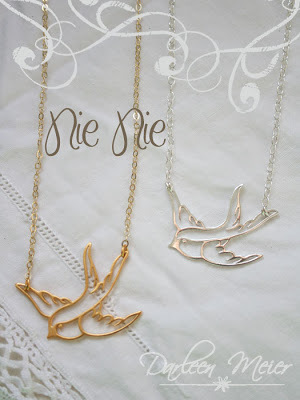 The post Silent Auction–Nie Nie Day appeared first on Darling Darleen | A Lifestyle Design Blog .